A couple of weeks ago me and three of my friends bought a four-pack of the game Dead Island for the PC. After seeing the awesome trailer, everyone was excited to play this awesome game. So we bought the game, and after receiving my game-code, I started the game, little did I know what I got myself into. The game started in windowed-mode, which I didn’t notice because it looked like it was full-screen. Usually in FPS-games I turn the gamma way up so I can see everything, I couldn’t do this because it was windowed. I had to change the game to full-screen, reboot, and then finally I could change the gamma. I like games where I can play with a small group of people, as a team, and this game took a lot of teamwork to get running for four players. First we tried using the online mode, this didn’t work because once three people connected to the same game, we all dropped out. Since we are all experienced gamers, we tried running the game on a Local Area Network using logmein hamachi, this worked after some trial-and-error. On a side-note, the server-browser of the game is really messed up, you need to specify in the options if you want to search for LAN or internet games, on top of that, you can’t search for games if you are already in a game with other players. Back to Hamachi and Dead Island, so, there was a problem where some people couldn’t connect if there were certain other people already connected. To clarify this I’ll introduce you to my friends: player A, player B, player C and me, player D. Suppose we have A hosting a game, B could connect to A, but then C and D couldn’t connect, but if B left either C or D could connect. For some weird reason changing the host didn’t seem to matter. The solution to our multiplayer problem consists of these 5 steps, I hope they will work for you too. Let each of your four players use these steps to be able to play this game online together. 2. Install Hamachi and get your friends in the same Hamachi group/channel. 3. In-game, change the network settings to LAN. 4. Let one player start a game and others join. 5. Play around with different connection orders until all players connected. 1. Me (player D), creates a game. Another thing you can try is to be in the exact same location as the other player. In my experience, I seem to connect a lot faster when both my and my coop-partners are both, for example, in the Jungle level. 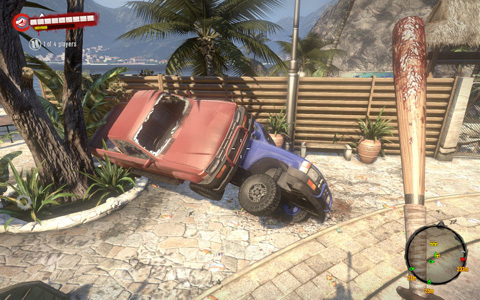 I really dislike Dead Island for making the multiplayer so complicated, it’s ridiculous. Once you start playing however, you will be able to enjoy the awesome car handling and physics.